Now located several stores up from its original location, Chambar is more spacious and larger, yet still maintains the same ambiance as before. We began our meal with their famous Moules Frites with the Coquotte option (with white wine, cream, smoked bacon lardons, white onions and spring onion). 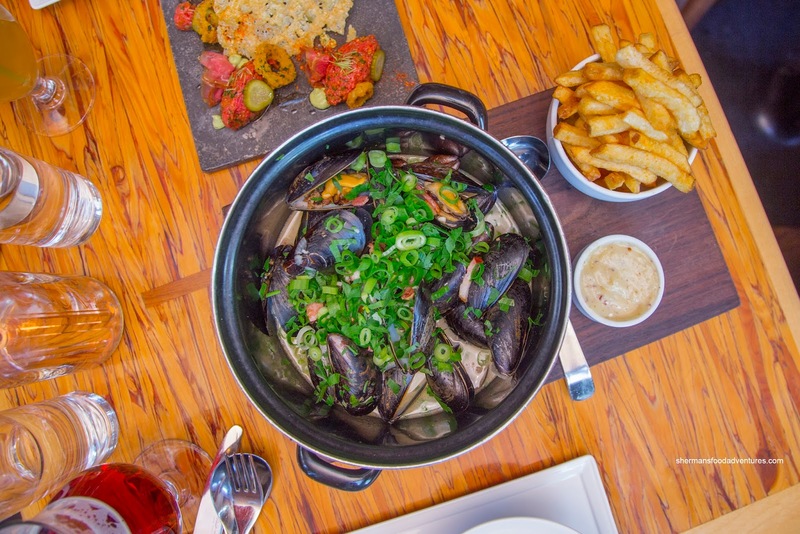 As expected, this dish was a winner with plump mussels sitting in an aromatic and impactful broth. What I liked most was the balance of flavours without a heavy reliance on salt. Rather, the bacon added the necessary smoky savouriness which went well with the sweet onions and properly cooked down wine. 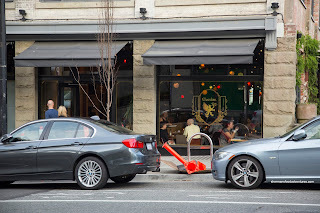 Served on the side was their frites which were hot and crispy while retaining a soft potato texture inside. 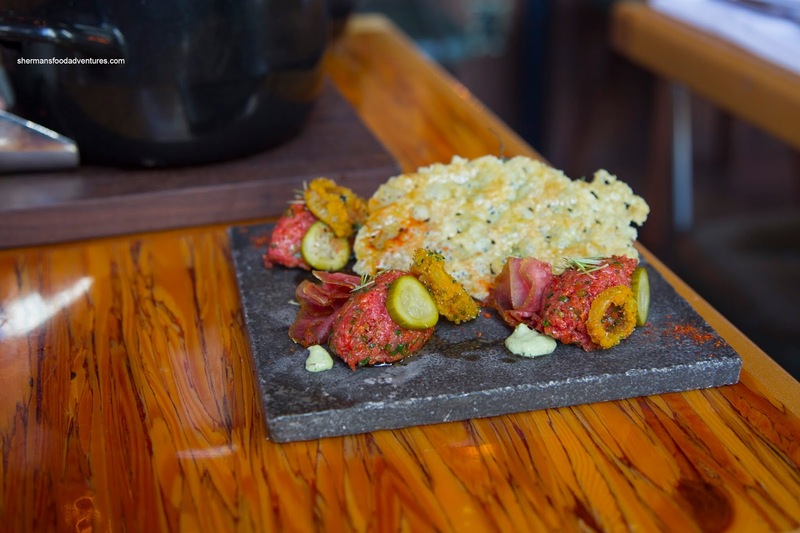 For our second apply, we shared the Tartare de Beouf consisting of espelette, caramelized morels, mustard greens, spruce aioli, cipollini onion rings and a Parmesan crisp. We found the beef to be buttery and completely melt-in-our-mouths smooth. There was a good kick from the espelette as well as a crunch from the greens. When eaten atop the Parm crisp, the salt content elevated the flavours even more so. Onto our mains, I had Le Steak du Jours with char grilled BC prime beef, smoked cheddar croquettes, pickles, green beans, pepper jam and chimichurri. I asked for the rib-eye to be prepared medium-rare and it was flawlessly executed. Crusted with peppercorns and rosemary, there was an aromatic pepperiness to each bite. 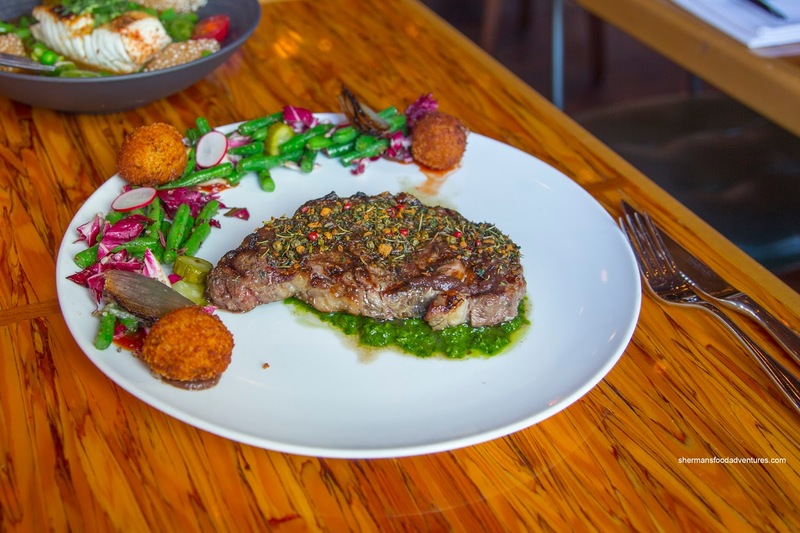 Underneath, there was a bright and smooth chimichurri that added just enough herbaceous bite without overwhelming. On the side, the crispy and relatively light croquettes were aggressively spiked with rosemary while kicked up a notch with the spicy pepper jam. The green beans were barely done exhibiting a vibrant and sweet crunch. 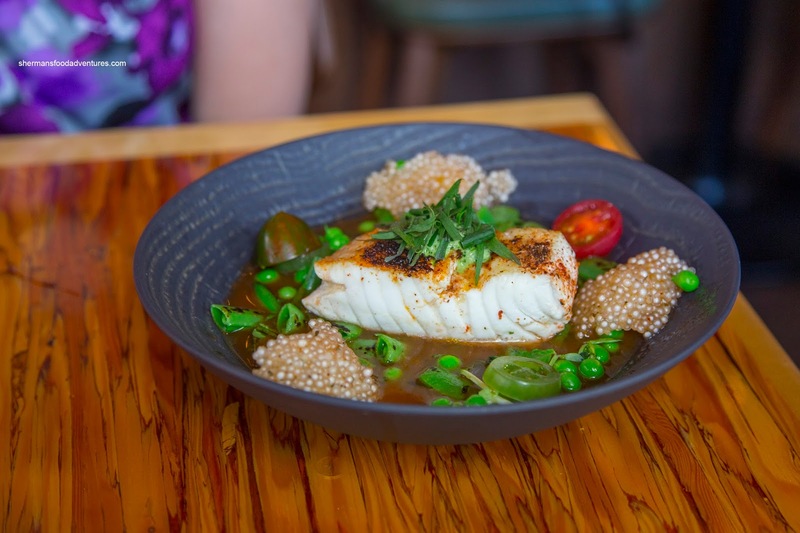 For Viv, she opted for the Fletan au Tamarin consisting of Haida Gwaii halibut, sea asparagus, sweet peas, mustard greens, spicy tapioca and jalapeño pistou in a tomato tamarind broth. As much as most of the halibut was flaky and moist, the edges were a bit dry. We loved the expert preparation of the veggies as they were sweet and fresh. However, we felt the dish lacked balance as there were too many tart components such as tamarind, tomato, mustard greens and jalapeno. Therefore, we didn't find anything that stood up to the dominant flavours. 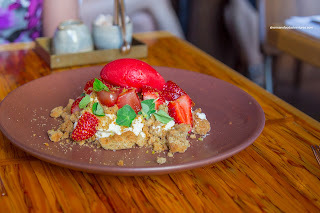 For dessert, we went for something light in the Aerated Cheesecake with graham cracker streusel, fresh and sherry compressed strawberries, strawberry sorbet, lemon, long pepper, and basil. This was a substantial dessert that was fortunately very easy to eat. 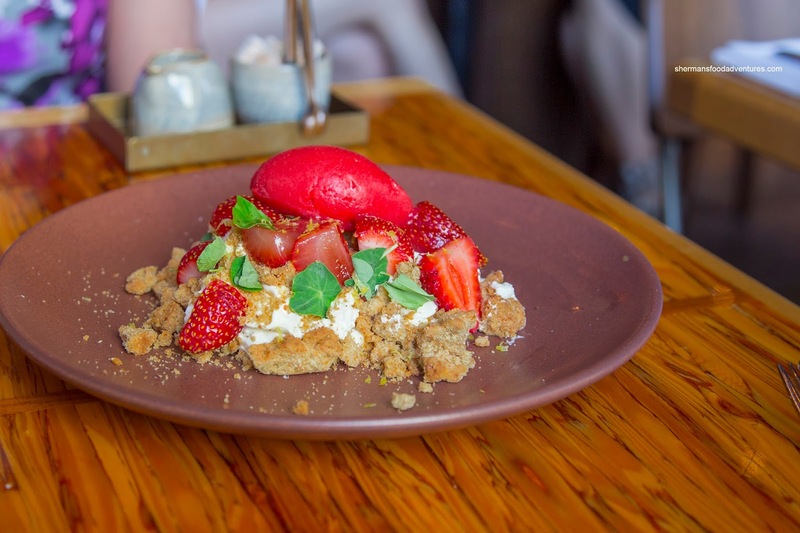 Creamy, extremely cheesy and mildly sweet, the cheesecake was accented by the sweet and tart strawberries. The sorbet added not only another layer of strawberry, but a contrast in temperature as well. Despite the overly tart halibut dish, Chambar met our expectations with carefully prepared food combined with attentive (while not overly intrusive) service. Yes, prices are high, but we left happy.